and parts rooms. A variety of size panels may be attached to walls or shelving for convenient placement. Ultra Series Louvered panels for small parts - Louvered panels may be mounted on any suitable surface including walls, benches, inside service trucks and cabinets or on carts. Fasten securely to assure adequate load bearing. Louvered systems are available in a variety of sizes from single panels to single and double sided mobile units. 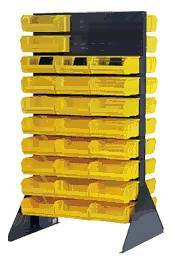 Free standing floor unit accepts all sizes of Ultra Bins (up to 120 bins, 750 lb. capacity). Bins sold separately. 36" L x 25"" W x 66" H. Free standing floor unit accepts all sizes of Ultra Bins (up to 240 bins, 2,000 lb. capacity). 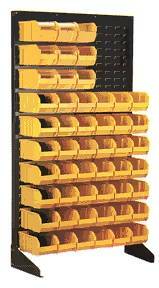 To find the number of Ultra-Hanging bins fitting on a rack see the table below. Individual Ultra Series - Hanging plastic bin pricing - go here !